This is a very popular sword around here. Outstanding geometry on the pommel, folks! Really wicked! Goes to show you that the simplest of pieces can be exquisite if one takes note of these subtleties. Thanks for the weekend treat, Howy! The Reeve is another beauty, Howy. Putting in some overtime up in New Glarus, I see. Love it. Simply love it. That is a wonderful looking sword. I can picture Norman knights down in southern Italy around 1050 using swords just like that one. I'm really looking forward to getting my hands on this model. Does the Brazil nut pommel make the Reeve handle differently than the Bayeux? Posts: 1,519 Location: Buffalo, NY. Looks great and I must say surprising so with the red grip which is my choice for what I believe to be historical reasons. Looks great and I look forward to receiving mine. Wow.... I was never a fan of the early medieval swords with brazil-nut pommels....yet I love them now...... Well done, Albion. Now THIS is what I've been waiting for!! This one just got bumped to the top of my list. The grip-color works great too. Is that oxblood or magenta?? Note to all Reeve lovers - the Albion webpage says "This sword is offered in a limited edition of only 100 collectible swords worldwide." I wonder why only 100 for this particular model? I like the Bayeaux better personally, but this one obviously turned out great and should do very well for you guys. Wow. Yet another one that I wasn't sure that I'd like and was soundly proven wrong. ;) You've got another winner, guys. For me this has always been the classic 11th century european design. Consuquently I ordered one to go with my 11th century kit. Agreed... it's been hard for me to resist this dude, and seeing it "in the steel" is making it a bit harder. Actually, upon looking at statistics, it might - albeit loosely - if the fuller and blade thickness jive with the profile of the scabbard. 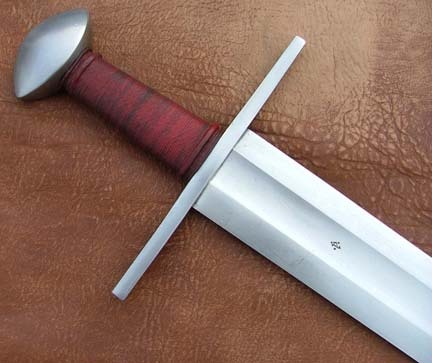 It's slightly narrower and a bit shorter that BJ, assuming the blade length and lower profile of the cross are pretty close to the Bayeux (which shares the same blade and has stats posted).